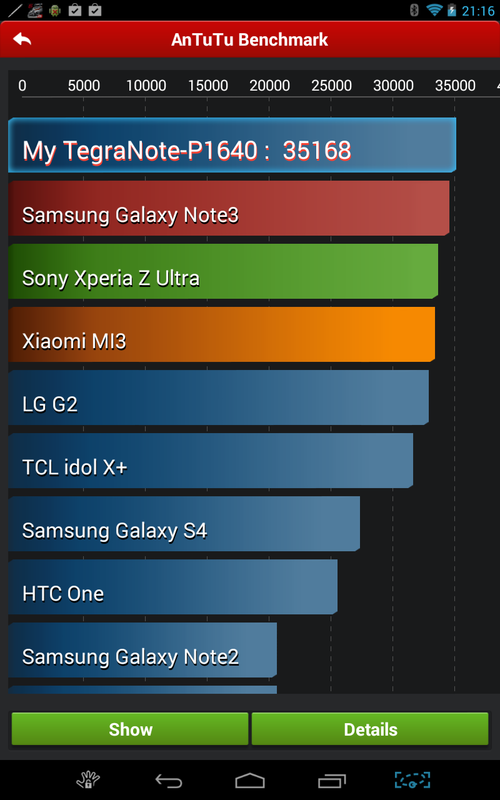 Well I just did an Antutu Benchmark test on my Advent Tegra Note 7 Tablet. Infuriating this was because I was looking for a diagnostic tool because I am suddenly getting low memory messages and apps have been going missing too?! The low memory message came up while playing GT Racing 2 which itself is so buggy that I personally would be embarrassed if I responsible for releasing this! It has some serious issues, it has been dropping sound on the HDMI connection everyone a bloody advert comes up but did not before it downloaded what looked like the whole game which is the second time this had happened as it went umm missing, lol. After skating the game for playability and their claims about realistic physics I discovered today that it previously was not installing and of the upgrades I PURCHASED for my car. I went from getting no higher than seventh yesterday to finishing country miles ahead of everyone else in every race?! Idiots. On top of this I was finishing the race in one Payton but then the game would drop me down several positions and I thought I was losing my marbles fit several hours?! Lol! As for the memory issues this did not happen before but the tablet refused to even take a bloody photo earlier today!! Then while playing GT Racing I Keir getting a low memory warning?! What got me earlier is it said I had low memory and memory not mounted and refused to take a picture! But in fact the Sandisk Ultra 32GB WAS MOUNTED and had 16GB of free memory!! The internal memory had 6GB free too so what the feck Android was on about I have no bloody idea?! It gets worse I am afraid! Only yesterday I took the third of three of these devices back to PC World because the battery was playing up and not charging. Before taking it to PC World I could not get it to turn on at all!! The owners sister has already had hers replaced which I did for her and that one refused to charge too?! But this latest one had to be sent off and I was not pleased with that despite the fact it was not mine. So I have sent an email to nVidia who designed it and I have sent a letter to Google. The one to Google was over Android problems asking with Blogger and AdSense, lol. Oh and YouTube as I certainly feel like I am being screwed! !